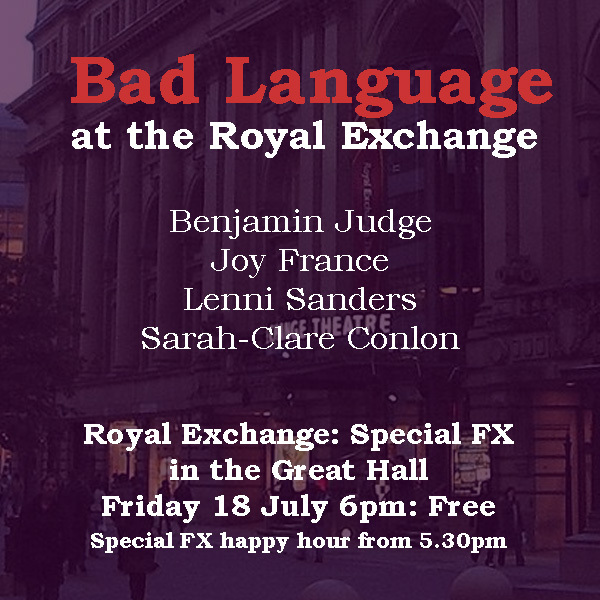 Bad Language bring 4 of the finest local talents to the Royal Exchange Theatre. An hour of spoken word performance from some of the shining stars of Manchester’s live literature scene, compered by Bad Language’s entertainingly deadpan new host Fat Roland. Featuring: Benjamin Judge. Joy France, Lenni Sanders and Sarah-Clare Conlon. It’s free entry at starts at 6pm sharp on Friday 18th July. Find us in the Great Hall (the main foyer bit).